Thank you for your continued support of the AAPT. It is through the annual subscription and enthusiasm of our members that the AAPT is able to represent the profession of anatomical pathology technology. The past twelve months have been perhaps the most important since our formation back in 2003. The huge implications of the proposed Modernising Scientific Careers (MSC) project remain the pivotal item on the Council agenda. The AAPT has expressed member’s views on these proposals and responded to the Department of Health MSC Consultation through membership of the Federation for Healthcare Science (FHCS) and in a profession specific manner. Regional networks are to be thanked for their informed input into these responses. Council believe that MSC is the single most important issue to affect our working lives in over 50 years. The proposals put forward will have a major impact on the workforce employed within healthcare science. 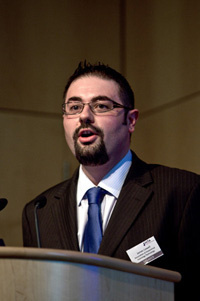 They also come at a crucial stage of modernising the career and educational pathways for technologists across the UK, as on the 1st October 2009 the AAPT was notified by the Royal College of Pathologists that approval had been granted for the content of the learning pack that had been produced by the AAPT Education & Training Committee. In simple terms, the AAPT has worked for several years to develop an appropriate educational and training programme that will deliver a flexible and competent workforce, which will be well placed to meet future service needs and allow APTs to continue providing high quality support to Pathologists whilst maintaining dignified care for the nations deceased, their families and friends. The journey towards statutory regulation of anatomical pathology technologists is still very much at the heart of the AAPTs work. We continue to support the idea that, via the good work of the Voluntary Registration Council (VRC), this goal will be achieved. In the response to the MSC Consultation the AAPT again reiterated that “the statutory regulation of aspirant healthcare science disciplines needs to be dealt with as a matter of urgency and that the MSC programme should not add additional delays to any process that is currently underway”. A highlight of every year is the annual conference and in 2009 this took place in London. A record number of delegates attended and feedback has been very positive yet again. Please pencil Saturday 18th September in your diaries for Conference 2010 in Manchester and register your attendance as soon as possible. It is the coming together of technologists that is fundamental to the essence of the AAPT – the updating of knowledge and the sharing of ideas. Regional networks have been established for London & South East, Scotland and in the South West. Plans are underway for an East of England regional network and we are pleased to continue working with the North East & West regional forums, all events will be advertised at www.aaptuk.org. The website has undergone a major revamp over the last year and I hope members are enjoying the new style and layout. The on-line ‘Read, Test & Reflect’ multiple-choice questions are now available again in the Learning Zone domain – thank you for the patience shown whilst waiting for new software to be implemented. If you have yet to do so, please remember to re-register for the Members Area. The next twelve months shall likely bring more challenges for the workforce in anatomical pathology technology. The financial pressure that every public sector worker currently faces is very much in my mind. We all have a part to play in demonstrating the added value that APTs bring to services and through engagement with the professional body we have a platform to share best practice and new or innovative service developments that will assist colleagues across the country. Be assured that the AAPT shall continue to raise a voice for technologists, who although small in number as a profession, have through the AAPT, representation with a significant number of organisations. The Royal College of Pathologists, Human Tissue Authority, Bereavement Services Association, FHCS, Institute of Biomedical Science and many other stakeholders have all sought the expertise and input of the AAPT. For the forthcoming year, the annual subscription fee remains at the 2009/10 rate. If you have taken advantage of the ‘Introduce a Colleague” offer, this is of course half-price. On behalf of the Council I would like to convey my best wishes to all members for the forthcoming AAPT year and for those undertaking examinations we wish you well.